Jef Neve , solo, at Kings Place in November. A performance that moved me very much, especially Joni Mitchell’s A Case of You, a song which Jef said had saved his life several times. His simple heartfelt introductions to each song, like we were in his living room, enhanced the enjoyment. His album One is on my Christmas list. Maciek Pysz at Pizza Express in March with Yuri Goloubev, Asaf Sirkis and Tim Garland. Reviewed here. And remembered most for the achingly beautiful Beneath an Evening Sky by Ralph Towner with duo between Tim and Maciek. Phronesis at Union Chapel in May. Clouds of dry ice softening our view in a huge venue, Anton’s smile when he saw friends on the front row. Jasper’s jokes. The sheer joy and energy of it, a wonderful huge sound, the retention of intimacy in a big space. Michael Wollny at Cheltenham Jazz Festival in April. I decided not to listen to anything by him before the gig, I had heard of his reputation, but I wanted to discover him for myself. So I was completely blown away by his virtuosity, huge presence and the togetherness of his trio, and the way I just “got” the music, from plain chant to rock. He did not disappoint. It’s great to be able to write that. Roller Trio at Stratford Jazz in October. It was such an honour to host Mercury Prize winners. It’s not just that they write such catchy tunes, instantly hummable, their own sound. It’s how they are on stage – no-nonsense, let’s get on with it and see what happens and let’s make sure people enjoy it because we will be enjoying it. Banks of pedals in front of James. Sounds that made your blood run cold with excitement and fear almost. Luke’s drumming that could be heard down the street. All these performances have one thing in common – they moved me, my life was richer because of them, and that is why they are my gigs of 2014. Thank you, every one. Perhaps as I write this I am subconsciously influenced by the proximity of the British Museum and the Elgin Marbles, but something about last night lodges in my thoughts under the heading ‘Timeless’, something about earthly nature being united with ideal heavenly beauty. 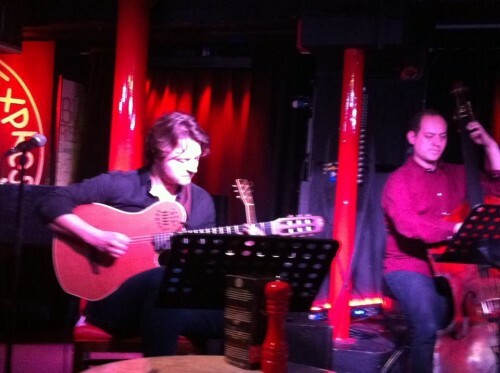 There were many moments in the opening concert at Pizza Express of guitarist Maciek Pysz’s Insight album tour that made a connection, for me anyway, between our physical presence, the transience of life and much deeper truths. This is a trio of superstars, Yuri Goloubev on bass and Asaf Sirkis on percussion. They hadn’t played together since November but those intervening months have only served to deepen their harmony as a trio, their instinctive support of each other. There was a darker feeling to the compositions, they took them slightly slower than the album, giving us the opportunity to relish the cool transcendency of Asaf’s drumming, the earthiness of Yuri’s mastery of his bass where the vibrations of his bowing come through the floor to connect you to the sound, and Maciek’s delight in tiny sounds like static floating in the air. His was a restrained performance, not showy, just impressive by what it omitted. To celebrate the start of the tour, Maciek invited Tim Garland to join them for several compositions including a new piece by Maciek called Desert. When Tim joined them for Those Days, the slightly Elizabethan dance feel of the original became a dark dense tango. And Insights (with its many notes) was strongly syncopated. But perhaps the zenith of this celestial evening was Ralph Towner’s Beneath an Evening Sky, which Tim has played with Ralph Towner. The gentle serene soprano sax in conversation with the guitar was very special, with space for Yuri and Asaf to add to the quiet atmosphere, the tiny pattering steps of hands on udu drum grounding us again. A couple of weeks ago I speculated whether this guitar/sax partnership would be Bill Frisell / Tom Rainey or Ralph Towner / Jan Garbarek. It was neither of course, it was subtle and mellow, and deeply satisfying. After the final piece, the audience were silent for just a beat, we had been taken somewhere very special. Try to see this wonderful trio somewhere on their tour. You will catch some of the magic. Why not start a major UK tour with a flourish? That’s what Maciek Pysz has decided to do in launching his tour at Pizza Express Soho on Tuesday 25 March and he has chosen saxophonist of the moment, Tim Garland, to guest with him. There have been some very celebrated guitarist/saxophonist partnerships in the past which seem to encompass every possible nuance: Joe Pass and Zoot Sims (jaunty); Pat Metheny and Joshua Redman (warm); Ralph Towner and Jan Garbarek (glacial); and to me, most intriguing of all, Bill Frisell and Tim Berne ( as in M from ‘Theoretically’ – just plain extraordinary – with its chiming, bell-tolling-like guitar undercurrent, discordant sax which melts into something quite mellow but still remaining menacing). What all these partnerships have in common is equality of relationship, you listen for both artists. So by inviting Tim Garland to be his guest at an important gig, Maciek Pysz is making a very bold statement. In a recent podcast for London Jazz News, Maciek said he’d written a syncopated classical piece after being inspired by Chic Corea’s ‘The Continents’. This piece eventually appeared for his trio as Insights on his debut album ‘Insight’. The Continents featured none other than Tim Garland. So it is will be very interesting to see and hear how their partnership is presented at Pizza Express. Buy a ticket and find out! Book tickets for the gig at Pizza Express here. If you can’t make Pizza Express then please make an effort to see the Trio at one of the other concerts on the tour, details on Maciek’s website. You won’t be disappointed, the Trio’s onstage chemistry is electric and deeply wondrous, and the album ‘Insight’ is very beautiful. And lucky people in Edinburgh get a solo performance!